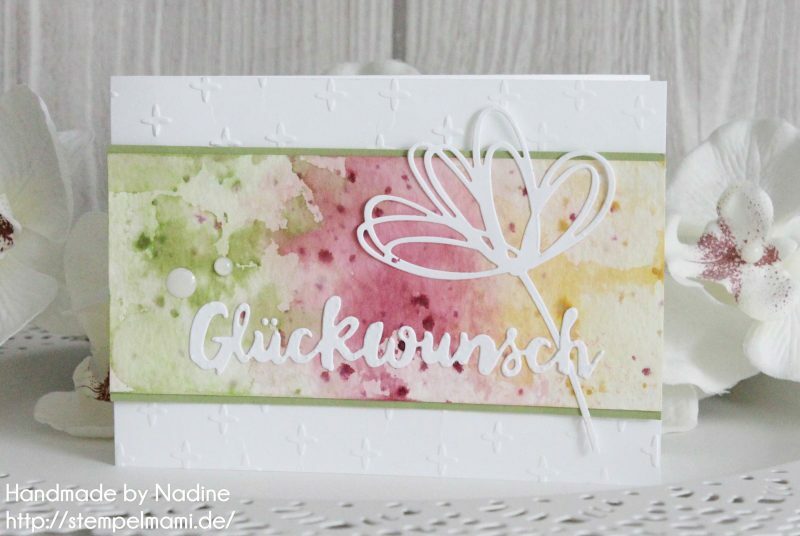 Welcome to the Crazy Crafters' Blog Hop with our Special Guest stamper, Nadine Koller - we are thrilled to have Nadine join us this month and I'm so excited to CASE (Copy And Selectively Edit) a project that has been created by her . Nadine has a beautifully delicate touch and a great eye for design and colour, so it was difficult to choose from all her gorgeous projects! I really enjoyed browsing through her blog in her original German - just using a translator for critical bits! What a great way that would be to learn a new language - as long as you don't rely on Google Translate, which would have us believe that the lovely Nadine might eat her children! "My dear ones, I am swinging into our kitchen now, because our kids are all coming from the school and wanting to be eaten." Haha! Shame on you, Google! I love the look of watercolour wash backgrounds (and Nadine is an expert!). I've never been good at them but I love this card of Nadine's so I've been practising! You'll very quickly see that my touch with colour is far less delicate and I need a lot more practice! I'm hoping the colours look right on your monitor - I found I had to make some adjustments because the beautiful Berry Burst colour was looking much too blue on my screen. To the watercolour background I added a Swirly Scribble cut in Whisper White, paper-pieced with Daffodil Delight card. 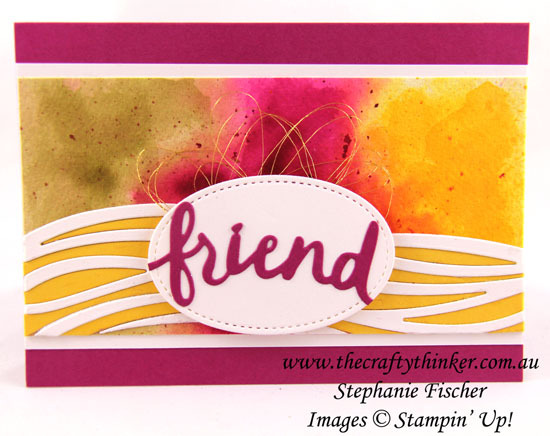 The word "Friend" is cut with one of the new Lovely Words dies - I simply snipped it out of it's little frame and glued it to a Whisper White oval cut with one of the Stitched Shapes dies. 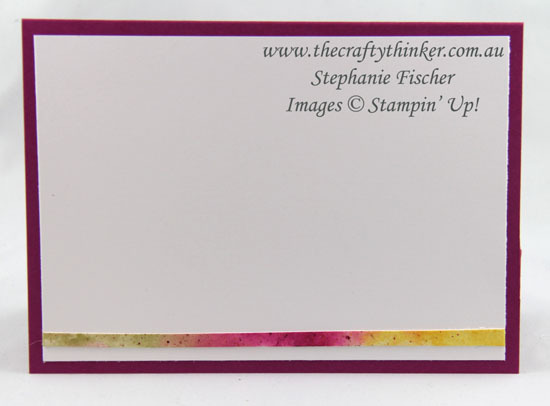 I adhered the panel to the card with Stampin' Dimensionals. I've added some twirls of Gold Metallic thread above the oval shape for a little more interest. 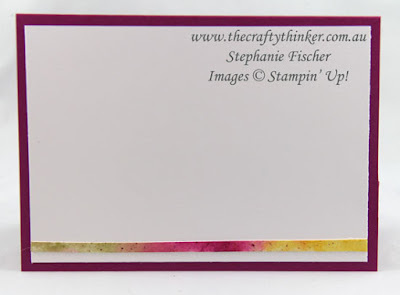 The decorative panel is layered onto a piece of Whisper White card and then adhered to the front of the Berry Burst card.